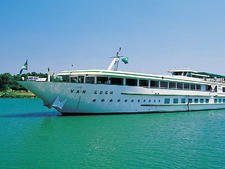 The 98-passenger Mona Lisa is one of a pair of smaller ships in CroisiEurope's fleet of European river cruise vessels. The ship and its sibling, Victor Hugo, each measure 269 feet in length and were designed for shallower rivers. Mona Lisa, which was built in 2000 and refurbished in 2010, sails three- to 12-night itineraries on the Tisza, Elbe, Danube and Rhine.